JAXA astronaut Koichi Wakata (at right) receives command of the International Space Station from Russian cosmonaut Oleg Kotov (left) during a brief ceremony held inside Japan's Kibo laboratory aboard the orbiting outpost on Sunday, March 9, 2014. 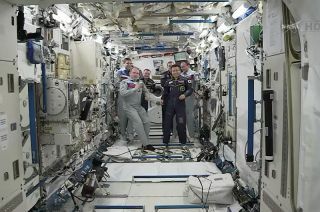 Wakata is the first Japanese astronaut to command the space station. Update as of 5:05 p.m. EDT: The landing team decided to go ahead as planned today. The Soyuz will depart at 8:02 p.m. EDT and land in Kazakhstan at 11:24 p.m. EDT. Three spaceflyers may not be able to leave the International Space Station as planned tonight (March 10) because of bad weather near their targeted landing zone. NASA astronaut Mike Hopkins and Russian cosmonauts Oleg Kotov and Sergey Ryazanskiy are currently scheduled to leave the station in a Soyuz spacecraft at 8:02 p.m. today (0002 GMT on March 11), wrapping up a 166-day orbital stint. But officials are concerned about wintry conditions on the steppes of Kazakhstan, where the Soyuz is slated to touch down about three hours later. Indeed, the landing team commission began meeting today at 4 p.m. EDT (2000 GMT) to discuss the situation, NASA officials said. "The weather is pretty rough over there right now," NASA spokesman Josh Byerly, of Johnson Space Center in Houston, told Space.com. "We are actually figuring out if we can do a 24-hour delay or not." The departure of Hopkins, Kotov and Ryazanskiy will bring to an end the orbiting lab's Expedition 38, which Kotov commanded. On Sunday (March 9), Kotov officially handed the reins over to Koichi Wakata, the first-ever Japanese astronaut to helm the huge $100 billion spacecraft. You can watch the Soyuz landing live on Space.com tonight, courtesy of NASA, if the spacecraft does indeed depart the space station as planned. Undocking coverage begins at 7:45 p.m. EDT (2345 GMT). Space.com will have more on this story as the situation unfolds.